Water Supply and Quality Book from C.H.I.P.S. 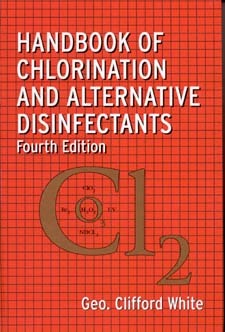 White's Handbook of Chlorination and Alternative Disinfectants reflects the current state of the science as well as the latest practices. For each disinfectant, the book explains its chemistry, effectiveness, dosing, equipment, and system design requirements. Moreover, the advantages and disadvantages of each disinfectant are clearly set forth. References at the end of each chapter guide readers to the primary literature for further investigation.